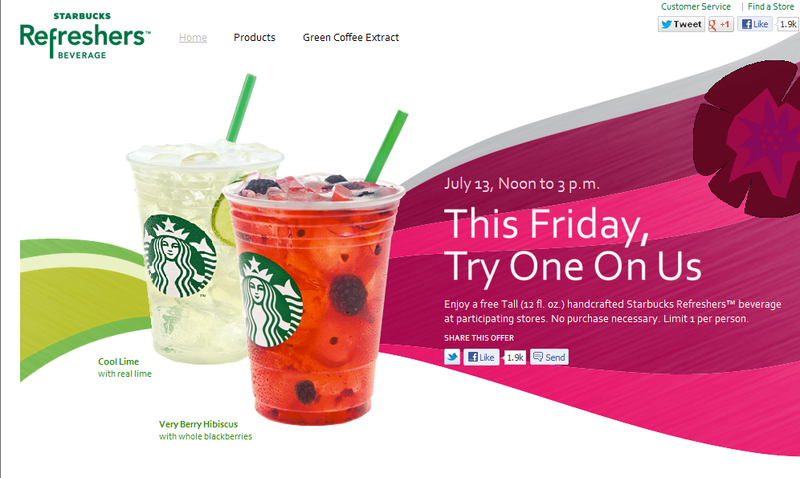 Go to your participating Starbucks this Friday between Noon and 3pm to get a FREE Starbucks Refreshers Beverage. These low-calorie drinks are made with real ingredients like whole blackberries, lime slices and fruit juice, and are combined with Green Coffee Extract for a thirst-quenching boost of natural energy. Starbucks Refreshers™ handcrafted beverages come in Cool Lime with real lime and Very Berry Hibiscus with whole blackberries. The Very Berry Hibiscus Starbucks Refreshers™ Beverage is real fruit juice and whole blackberries shaken with Green Coffee Extract for a boost of natural energy, served over ice. The Cool Lime Starbucks Refreshers™ Beverage is real fruit juice, mint and a lime slice shaken with Green Coffee Extract for a boost of natural energy, served over ice. No Purchase Necessary. Limit one per person.